Guild BioSciences has pioneered biosensor research to improve the speed and accuracy of bacterial pathogen detection using reporter bacteriophage (phage). A reporter phage is a phage that is engineered to produce a signal upon infection of target bacteria. 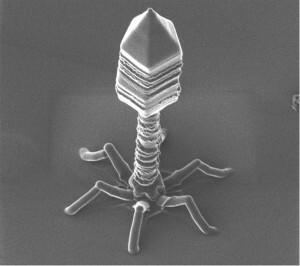 When a reporter phage infects the target bacteria, they commandeer the cells' machinery and produce a readily detectable signal, indicating that the target organisms are both present and viable. Guild BioSciences holds several patents and pending patent applications on reporter phage technologies in both the US and internationally. Highly sensitive - Guild BioSciences scientists have achieved sensitivities as low as 101 CFU/mL. Highly specific - phage are naturally bacterial-specific. The Guild BioSciences team choose wisely when selecting a phage for reporter phage development, ensuring these phages have the appropriate specificity. Low cost - unlike molecular diagnostics, phage reagents are inexpensive. Rapid - Scientists at Guild BioSciences have been able to achieve impressive detection times that rival or surpass that of molecular-based approaches. Adaptable - the system can be adapted to fit high-throughput, high volume or single assay, low-volume scenarios. Simplicity - the procedure is simple and easy to perform, making it ideal for many different settings, such as clinical laboratories, point-of-care (POC), in-field, or food testing laboratories. Lateral flow immunoassays are a proven technology that offers many advantages. They are easy-to-use, disposable, inexpensive, and robust POC devices that have carved a niche in nearly every market. The deficiencies of lateral flow immunoassays are their lack of sensitivity, specificity, and multiplex capability. Guild BioSciences is currently investigating new variations on this well-established technology to allow for expanded use in current markets and potentially open new ones.